Who are you? Tell us a bit about yourself and your ensemble. I am a baroque and renaissance flutist and member of DISCANTVS. I started playing renaissance flute in a consort when I was studying in Holland and, as luck would have it, I was the tallest one in the group and had the longest arms. No one else could even hold the bass flute let alone cover the holes, so I became the bass flute player. I quite like it, I suppose that every flutist has a bit of “bass envy” and this is a great way to fulfill it. I think that I can state with some certainty that I am one of the only bass renaissance flutists in town, the other being my partner, Boaz Berney, who also plays in DISCANTVS – although only one of us plays bass at any given time. What was your first concert as an ensemble? Do you have an anecdote to share? I think our first paying concert was at a guitar festival, strangely enough. We had a programme for flute consort and lute and the artistic director of the festival was quite taken with the idea of the lute. Tell us about the most ridiculous thing that had ever happened to you during a concert or a tour. We had a mini-tour once that was a complete comedy of errors. Fortunately it was short! About five years ago, in the pre-smartphone days, we had a concert in Ottawa, a city which none of us were familiar with. We rented a car to get there and when we went to pick the car up the only one available was a huge, boxy white Chrysler. Despite looking huge, it was really cramped inside and had a very small trunk, so the five of us were all piled in with all of our instruments and clothes feeling a bit like sardines. We had printed out the directions to get to the church where the concert took place (the type of directions that tell you every little detail and take 4 pages to print out for even the most simple trip). On the way there we got stuck in traffic and so were running a bit late. Finally, with much relief we pulled up our destination, only to realize that it was a papered-up, abandoned storefront in a fairly shady part of town. Somehow in the rush to print out the instructions, I had entered the wrong address. We tried calling the church but no one was answering. We tried asking passers-by, but none of them had heard of any churches in the area. We drove around in circles for a while, becoming increasingly desperate, and finally somebody at the church answered and gave us directions. The concert went really well, and we drove home in a much better mood…until the gas light went on. Our gas-guzzling Chrysler had used up an entire tank just on the trip to Ottawa! Somewhere in the middle of rural Ontario at around midnight is not the ideal time to be looking for a gas station. We found one with a snoozing attendant who said that they were actually closed….unless we really needed gas and could pay in cash. We all pooled our cash and managed to make it home! What is your personal relationship with music? What sort of music do you like to listen to? I like to listen to a variety of different styles of music, most of which would be considered either “classical” or “traditional” . In addition to Renaissance and Baroque music, which I love to both play and listen to (as one would expect), I also love Indian Karnatic music, traditional Turkish “halk” music, and old fashioned jazz and blues, to name just a few. In terms of my “personal relationship” with music, I sometimes wish I had more time to simply sit down and listen to music. I rarely have music playing unless I can listen to it with undivided attention, if I have to concentrate on other things at the same time I would prefer to just have quiet. A constant background of top 40 radio is my personal definition of hell. Can you suggest a motto for NovAntica? Think big and dream bigger! NovAntica is in a position to become a driving and uniting force on the Montreal concert scene. Having so many member ensembles of such great variety means that there is a lot of potential not only to realize larger and more daring projects but also to experiment with more intimate concert concepts and venues. My favourite place: Musée des beaux arts. Specifically the one in Montreal, but actually I love museums in general. I could spend hours wandering around museums. My favourite book: The Thousand Autums of Jacob de Zoet, by David Mitchell. What is your favourite après-concert restaurant/bar? Going out after a concert used to be one of my favourite activities. By the time the concert is finished you have worked up a good appetite by playing all sorts of wonderful music and there is nothing as satisfying as that first bite of food (or sip of drink) and a full re-hash of the concert with your colleagues. Now that I have two small kids, post-concert meals are usually at home, especially if my partner plays in the concert too. There used to be an Uzbecki restaurant that I went to years ago that epitomized post concert dining for me. They were open late, close to home and had a selection of hearty dumplings, grilled meats/offal and salads, all of which were cheap and ready in minutes. They also sold vodka by the bottle. The grill man was rather surly and wouldn’t let you order the offal unless you were quite insistent. 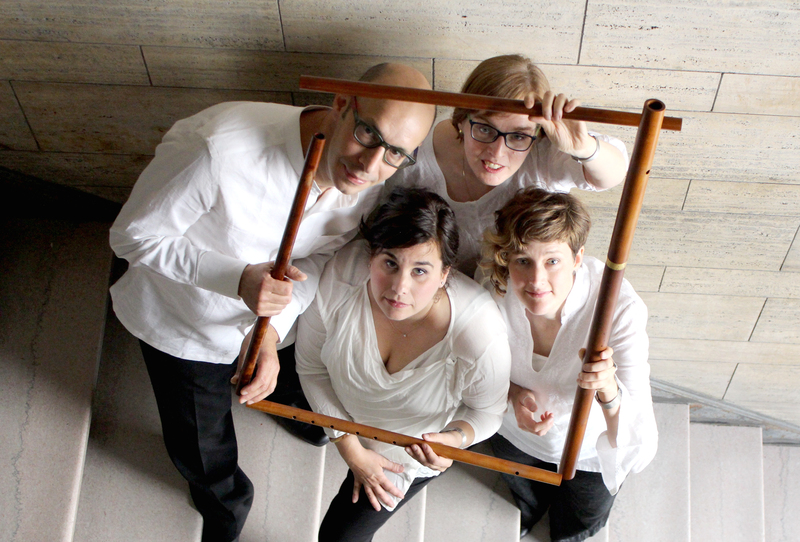 Come see our concert, Qui Regna Amore with Suzie LeBlanc, on Thursday, the 11th of February at 19:30!